Dolphin Discovery Swim + Ferry St. John Approx. Dolphin Discovery Tortola - St.Thomas offers a fun and educational way to interact with these amazing marine mammals. The Dolphin Discovery Swim allows guests to swim with the bottlenose dolphin and interact with them in an environment where they are comfortable and free to play and show off the tricks they've learned. Visitors to Tortola can have the adventure of a lifetime by visiting the bottlenose dolphins who swim in the waters near Tortola Island. 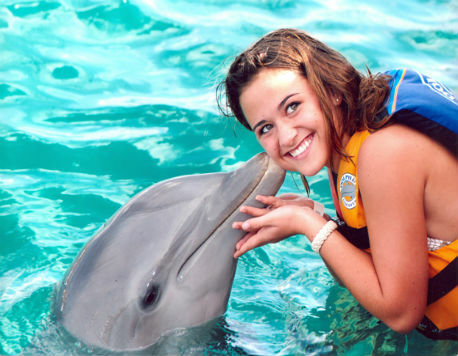 At Dolphin Discovery, we are excited to share our amazing dolphin friends with guests, both young and young at heart. These animals are extremely intelligent and enjoy interacting with people. They love showing off and especially love to play in the water with children. Swimming with our dolphins is sure to be one of the best parts of your vacation and one that you're sure to remember. Our dolphin swims includes a ferry from St. John to the Tortola Island. The package also includes a boxed lunch for all guests. We provide our guests with an excellent vacation memory and photos of the swim can be purchased separately. Ferry taxes aren't included in the price and need to be paid directly to the ferry office upon boarding the ferry. The ferry ride takes guests across the beautiful Caribbean where you can enjoy seeing the turquoise waters before diving in to play with the dolphins. Be sure to arrive at least 30-minutes before your adventure is set to begin for a brief introduction on how everything works. Once you get in the water, you can spend time interacting with the dolphins and they will be happy to share their tricks. They can give guests a hug, a kiss, a handshake, and even a serenade with a song of their choice. Our adventure dolphin swims are available Monday through Friday at 11:00 AM and 1:00 PM. This water adventure is fun for all ages and even young children can join in. Children ages 1-5 may be eligible for free admission and this should be inquired about upon reservation of your tour. Children need to swim with an adult. We provide life jackets for all guests who participate in our water activities. We also encourage all guests to wear biodegradable sunscreen to protect themselves as well as the local environment. We keep the groups to 20 people or less at a time to be sure that everyone is able to get the full interaction with the dolphins. This is truly an unparalleled experience and we would love to share our dolphin friends with you and your family on your next trip to St.Thomas.